One morning in early October, 1604, astronomer and mathematician Johannes Kepler was startled by his colleagues’ shout of “There is a new star!” Where? Slightly above the much-anticipated rare conjunction of the planets Jupiter, Saturn and Mars, known as the “fiery trigon”. Kepler, Imperial Mathematician to Emperor Rudolph II, had to wait days for the clouds to clear, but he went on to observe the supernova in the early hours before dawn, then publish his findings in De Stella Nova. And this new star got him wondering: could this conjunction coupled with the new star hold similarities to the Star of Bethlehem? As a young man, Kepler earned a scholarship to study for the Lutheran ministry at the University of Tübingen, Germany. While there, he learned of Copernicus’ heliocentric ideas and redirected his studies to mathematics. Due to the counter reformation, Kepler moved to Prague to study with the Danish astronomer Tycho Brahe. When Brahe died, Kepler took over his position as Imperial Mathematician. Using Brahe’s observation data, Kepler proved that the planets’ orbits were not circular as Copernicus had stated, but elliptical. He went on to prove other laws of the planets but referred to these as harmonies, as that of the system set in place by the Creator God. Thus, he embraced the heavens as a celestial symphony moving in a predictable, logical, and provable way. Contrary to many of his Earth-centric contemporaries, Kepler was not prone to superstition nor portending catastrophe, nor did he believe that the conjunction caused the supernova. His calculations proved the huge distances between the planets making that impossible. Yet he never relied on his thoughts alone, but read, supported and conversed with such contemporaries as Galileo. After reading Laurentius Suslyga’s book that Christ was actually born in 4 BC, Kepler, spurred on by his innate curiosity, calculated that the fiery trigon only appears once every 800 years. In the years 7 BC and 1603 alike, Jupiter and Saturn appeared together three times. In each of the respective years, Mars entered the conjunction. If Christ was born in 4 BC, that is the current year is behind by 4 years, the date falls within two years of the great conjunction that initiated the fiery trigon. ©The Royal Astronomical Society of Canada. Provided by NASA Astrophysics Data System. There’s more. The Jewish midrashim known as Messiah-Haggadah speaks of the Star. Midrashim are rabbinical commentaries of the Old Testament based on a specific topic rather like a concordance. This one in particular states that over the course of 7 years famine will occur followed by abundance, and the Star shall shine forth from the East, and this is the Star of the Messiah. In other words, the star would appear 2 years before the birth of the Messiah. At the end of the second year, the birth would be expected. The timing aligns with Kepler’s calculations. But what about the evanescent Star? Something as unique as three planets aligning would catch the attention of men whose living was to watch the skies, yet there had to be something even more extraordinary. And it wasn’t just the Magi. The Chinese have long been regarded for the recording of events dating back to nearly 2000 BC. Their accuracy and persistence derived from the basic need of timekeeping to mark the rise and fall of dynasties. Just as important, tradition held that Chinese rulers take their mandate for daily life on Earth from events in the sky. Hence, Chinese astronomers answered to kings and emperors and took careful notice of guest stars and unusual occurrences that appeared among the well-known stars. The Chinese cataloged observations continuously spanning 4000 years thus leading to many astronomical discoveries. In the year 5 BC, a tailed comet was recorded as appearing for 70 days from March 9 to April 6. A comet could more easily fit the parameters mentioned in the Bible of the star’s movements, disappearing and reappearing, hovering and changing directions. In any event, Kepler’s accurate calculations have withstood the test of time. He was the first to understand refraction in vision, explain how a telescope works, form the basis of integral calculus, and explain that tides are caused by the moon, among other things. And he is credited with deriving the birth year of Christ which is universally accepted. What became of Kepler’s supernova, the last to appear in our Milky Way galaxy? NASA’s Chandra Observatory took pictures of the remnant of SN1604, and NASA honored Kepler by naming their space telescope after him. Throughout his life and writings, Kepler felt he was a messenger given a glimpse of God’s Wisdom for the sake of mankind. A brilliant man of science yet humble before God. Truly, a Renaissance man. Posted in Oath of Iron. WARNING – Not for the squeamish. Imagine stumbling across an 800 year old gravesite. An amazing find to be sure, but even more startling, the skeleton is completely intact except for the head which is resting on the legs. Or how about a skull with a brick jammed into its mouth, skeletons with feet and hands lopped off, leg bones broken, or actually staked to the ground? Ever since I learned of humiliation wounds inflicted on King Richard III after his death, I’ve been wondering if such behavior was rare or the norm. As I’ve stated before, in the Middle Ages death was a public spectacle. And it appears that public opinion mattered to an enormous extent. Archeologist Caroline Arcini of Sweden’s National Heritage Board has documented over 600 burials all over the world where corpses were found buried face-down. She’s of the opinion that “shaming the dead is a deep-rooted human trait.” This echoes other scientists’ opinions of corpses in Europe found in the prone position, that these people lived some type of deviant life, for example witches, rule-breakers, prisoners, and the like, and hence deserved a burial that deviated from the normal practices. Normal Christian burial meant the body was laid to rest face-up with feet to the East and head to the West. The arms rested at the sides or perhaps crossed over the chest. The majority of the face-down gravesites were found outside sanctioned church yards. But these latest deviant burials add a whole new level of bizarre. Why would the living do this to the dead? Recent text discoveries prove the manifestation of superstition and the grip it had on medieval society. At that time bacteria and infection passing from person to person was not understood, nor how disease could spread from place to place. Deaths that came on suddenly or tragically led to the belief that the departed souls would not pass onto the next world. Overcome with fear of the unknown, medieval society tried to find answers. So, when someone died in a disturbing way, they wanted to be certain these people never rose up again to torment them. Laying their fears to rest made them feel better, feel safe. Hence, they buried these bodies dismembered or staked into the ground to be sure the dead stayed dead. Deviant burials appear to trail off during the 1200s when the Church spread its influence to create more civilized communities and provide localized support. But even with this understanding of the medieval mindset, it’s still really creepy. The Kingdom: Part 2 is here! Yes, true believers, Part 2 is now ready for your enjoyment! When last we left them, the MacKendrees tried to outsmart Grizmund, only to escape into the desert. After a fierce sandstorm separates them, Princess Gemria finds herself alone. Soon captured by Arabic nomads and taken into their camp, she must find a way to rejoin her brothers. But, Sheik Rameesh has other ideas. Join me in Part 2 of The Kingdom, as the Oath of Iron series continues. Posted in Books, Oath of Iron. Magi. The ancient word conjures intrigue. Who were these men? And most of all, what drove them to travel so far to pay homage to the newborn King? Mosaic of the magi in Sant’ Apollinare Nuovo in Raveena, Italy, 526 AD. Magi depicted in Persian clothing saved the church from being destroyed by the Persians in the early 7th century. The word magi, plural form of magos, is believed by many scholars to be Babylonian in origin. According to Strong’s Concordance, magi means “wise men, teachers, priests, physicians, astrologers, seers, interpreters of dreams, augurs, soothsayers, sorcerers etc.” Hence, it’s easy to see where the modern word magician comes from. The first time magi or magus was used was in the 6th century BC, in the Old Testament book of Daniel, when said wise men were called upon by King Nebuchadnezzar to interpret his dream. Recall that prior to this, King Nebuchadnezzar had seized Jerusalem and carried off the young educated men of Israel. Daniel and his three companions were cast among the magi. When no one could interpret his dream, Nebuchadnezzar ordered all the wise men be put to death. God provided Daniel the interpretation of the dream, not only saving him and his fellow Jewish companions, but the lives of all the wise men. Subsequently, the king placed Daniel in charge of the wise men, as well as over the entire province of Babylon (Daniel, chapter 2). Later we see Daniel continue to distinguish himself when King Darius set him up as a satrap (governor). This was typical of the additional duties magi performed, such as confirming the divine nature of the kingship, supervising the collection of land-taxes, and acting as judges. Meanwhile, as these events with Daniel took place, there was a religious reformer named Zoroaster and his followers were called Zoroastrians. This group remained active throughout Babylonia for hundreds of years including during and after the time of Christ’s birth. In fact the King Vologeses I (51-80 AD) reinstated these magi at his court, and it was common practice for magi to visit and be accepted at court by other kings. But could there be a deeper reason for their desire to pay homage? It turns out King Vologeses had family ties leading back to King Darius. Traditions and the passing on of knowledge is tantamount in keeping a religion alive. It is doubtful that the tales of Daniel and his God missed the magi’s notice. Whether they loved or hated him is not the point. The prophecy and dream interpretation made by Daniel (Chapters 2 through 7) was recorded not in Hebrew like the rest of the book, but switched to Aramaic, the language of the world. So at any time afterward, anyone could read how God granted that gift to Daniel, and that his prophecy of the Gentile world had all come true. The part in Aramaic also covers Daniel’s vision of the coming of the Son of man (Chapter 7). Couple this with the fact that the magi were trained to watch the skies for signs, as stars and comets were regarded as heralding the birth of kings. Could it be that Daniel’s faithfulness in foreign captivity began a traditional teaching among the Zoroastrians and passed down through the generations of magi? One more thing to note: After Jesus’ death and resurrection, the apostle Jude (also known as Thaddeus) went into Armenia and parts of Persia and in his mission work there ended up converting 3000 Zoroastrians to Christianity. Did he reference their homage to the newborn Jewish Messiah as the bridge to their salvation? Whoever the magi were, they were certainly the first Gentiles with authority to recognize Christ as King. …and behold, the star which they had seen in the East went before them, till it came and stood over where the young Child was. 10 When they saw the star, they rejoiced with exceedingly great joy. 11 And when they had come into the house, they saw the young Child with Mary His mother, and fell down and worshiped Him. And when they had opened their treasures, they presented gifts to Him: gold, frankincense, and myrrh. Posted in Oath of Iron, The Walk. Ten years ago, my local library held a Medieval-themed summer reading event featuring a group of real knights. Of course, I was all over it and jazzed when I saw these knights go steel-on-steel in full armor. This is no reenactment – it’s the real deal. That day I met Buck Holmes. He and his current group, The Knightly Order of the Fiat Lux, use their talents to raise money for charity. In addition, they help me choreograph fight scenes for my stories and answer my questions about weapons and tactics. It is an honor to welcome him to Oath of Iron.com. Karen: All hail Sir Buck! The obvious first question is when and how did you become interested in being a knight? Sir Buck: I got into Dungeons and Dragons when I was 12 which got me interested in legends and lore, especially from the Middle Ages. Once I started reading stories about King Arthur, I was hooked. Karen: I know you’re an avid reader – how much does your interest in Medieval times affect what you read? Favorite authors and books? Sir Buck: The vast majority of things I read is Fantasy or Medieval (fiction and non-fiction), so quite a bit. I have a lot of favorites: Ray Bradbury, Tolkien, the history books of Barbara Tuchman. I highly recommend Chretien de Troyes as well. Karen: Does the armor you wear reflect a specific time period? If so, why did you choose that time? Sir Buck: Our primary concern in KOFL is safety – we try to avoid historically accurate injuries as much as possible. So we often have to suspend historical accuracy for safety and cost concerns. Keeping up your harness (suit of armor) is time consuming and expensive. As much as possible, my armor is based after 13th century English knights. In my opinion that was when knights were the coolest. And the period was when a lot of the Arthurian and Robin Hood myths were created (basically). I love the barrel helm and surcoat look. Karen: It’s very impressive. How much weight are you carrying when you are fully suited up? Sir Buck: Only 60 to 80 pounds. Karen: Only? That sounds like alot! Sir Buck: It’s well distributed across my body so it’s not too bad. I would rather walk around with 60 pounds of armor than carry a 30 pound backpack. Plus, when you are wearing full armor, it makes you feel really macho or something so the joy is bigger than the burden. Until the temperature gets over 85 degrees. Karen: How much does your sword weigh? Sir Buck: Only 2 to 3 pounds. Swords were not as heavy as a lot of people believe. Karen: What are your favorite weapons to fight with? Sir Buck: My two favorites are longsword and sword & shield. German Longsword has a a rich history as a martial art. But sword and shield feels the most “knightly”. Karen: What pieces of your armor wear out or break the most from battle? Sir Buck: Interesting question. The cloth, I think. You wear padding or heavy cloth under your maille so that padding and the surcoat often rips. It also gets funky smelling and stained due to sweat and rust (just to be honest). Pins and straps break a lot as well, making the piece of armor useless until fixed. Butted maille (as oppose to riveted) will break easily so you need to be careful how you use butted maille. We tend not use it. Karen: What is the visibility like from inside your helm? Sir Buck: Once you train yourself how to look out, it’s pretty good. It’s similar to wearing glasses or watching action on a stage. You lose peripheral vision and some low vision (along the ground), you have to learn to adjust your head movements to compensate. I think the helm interferes with hearing more than vision. Most of us are wearing two layers of padding under the helm and over our ears so the marshals have to shout and repeat themselves to make sure everybody hears what is being said. Karen: What does it feel like to take a blow to the head? Do you feel the hits to your body? Sir Buck: If your helmet is set up right, a blow to the head will feel like a punch to the head. Not comfortable but not bad. A really good hit will “ring” you, much like what you see in a Bugs Bunny cartoon. But those are rare. I guess I feel about half of the hits on the body. Mostly it depends upon the exact location and the angle of the attack. Gussets (spots where the armor isn’t as strong, like the inside of the elbows, back of the knees, and the armpits) are the worst spots to get hit in. A really good hit will leave a bruise, even where the armor is strongest. Karen: Have you ever been injured to the point of needing medical attention? Sir Buck: I broke my collar bone fighting a woman once. I have also probably broken my fingers and toes but I didn’t go to the doctor for that. Karen: You’re tough. How long can you do battle before your arms give out? Sir Buck: Going full out, only two or three minutes. Past that you need to stop, readjust, grab a breather, etc. After about 30 minutes of being in the field, I’m done. It’s about the same as a boxing match: you rush in, take a rest, wind down as the fight goes on and by the end of it, you just want to collapse. Karen: We’ve all heard myths about knights and/or their armor – which is your favorite? What is the truth? Sir Buck: My least favorite is the one that comes to mind first: that knights waddled out into battle and bashed each other until somebody fell down. Knights were mobile, could easily get up if they fell, and relied on speed and skill as much as brute force. In KOFL, we run around, fall, get up, and jump around in our armor. And if overweight, middle-aged guys from the 20th century can do all that, I know medieval knights could do more. Karen: I’ve seen you guys dance in your armor so I know that to be true! You and your fellow Knights of the Fiat Lux fight for charity – which ones? Sir Buck: Just about anything that helps the needy. We donate to Autism Society of NC a lot; they are a great organization that does a lot of good. We are also proud to donate to Wounded Warrior Project to try to repay a little of the debt we owe wounded veterans. Each year we set up charity goals called “Dragons.” So our charities change from year to year and chapter to chapter. Karen: That’s awesome. Tell everyone about your fundraiser coming up this weekend, the Fantasy Gamers’ Conclave. Sir Buck: We try to use all of our nerdly talents to help the community. So we also play games for charity. Our 7th annual Fantasy Gamer’s Conclave is on July 25 and 26 in Cary, NC. All proceeds from this event will be donated to the Autism Society of NC. We will have fight demonstrations, RPGs, board games, card games, miniature games, a Retro Video Game Museum, and an Anachronic Tea on Sunday. Karen: Sounds fun! Anything else you might want to add? Sir Buck: I am very proud of the Knightly Order. We are from many different backgrounds, lifestyles, and faiths. And yet we respect each other and work together to help the community (and bash each other in the head). My hope is that we can show others that it is possible to make things better. Karen: Well met! Thank you, Sir Buck and my best to you and all the Knights. Even more information can be found on the Fantasy Gamer’s Conclave facebook page and on the KOFL (Triangle Chapter) facebook page. Huzzah! Imagine William Wallace meets Saladin and they combine forces to fight a brutal enemy. The first release of my medieval adventure series, Oath of Iron, is available on Amazon.com! 1) The book is large. In its entirety it will run at least 500+ pages. While I didn’t write it as a serial, I am releasing it as one using the divisions I already created. This way, I can provide readers content faster as I plan to release the parts within months of each other. 2) It’s a daunting task to tackle the entire book in one fell swoop. I had to come up the learning curve to discover the ins and outs of self-pubbing while also doing a final edit. 3) It’s kind of like a soft opening of a business to test the waters and see how much interest I can stir up, starting slowly and building up as each part gets added. And at the end, I can combine all the parts into a single download. At that time I may do a paperback release as well. After the initial sting of early criticism wore off, I decide to take what the professionals said to heart. They said my book is too big and that I should think smaller. They said e-pub was the place to start. But some of their advice I’ve rejected, like dividing my book into 4 smaller ones – no, The Kingdom is still one book. While I could rewrite it to fit a “more books” model, the story would suffer too much. Also, I was told putting Muslims and Christians on the same side is a bad idea and not true history – no, on both accounts. It’s a good idea in that I can set the characters around a campfire to engage in conversations about the similarities and differences of the two religions. In fact, alliances between Christians and Muslims happened quite often during the Crusades. Even while pitted against each other in battle, King Richard the Lionheart and Saladin had the utmost respect for one another. All of that was the catalyst for Oath of Iron. Oh yeah, and the advice about how a Christian story can’t have a Muslim hero. That I rejected outright. The Black Death: A discriminating killer? The Great Plague, the Black Plague, the Black Death – call it what you will, it was the greatest scourge the Medieval World had ever seen. It arrived in Sicily on disease-riddled ships in 1347, and swept through European cities and countries wiping out one-third to one-half of the entire population, killing 20 million people in its wake. Illustration of bubonic plague in the Bible (1411). US public domain – copyright expired. People’s rapid demise coupled with the mystery of contagion added to the horror. While it was observed that being in contact with infected people, their clothing or houses was a factor in catching the disease, the idea of contagion was incomprehensible at that time. Physicians were more likely to blame the position of the planets. Meanwhile, the young, old, and every age in between died in droves, so quickly that pits became massive gravesites. Rarely did anyone survive, but some did. Did the plague discriminate or was everyone susceptible? Sharon DeWitte, a bioarchaeologist, is trying to discover just that. She spends her summers in London studying the bones of Black Death victims. She’s recorded metadata on each of the 2000 skeletons she’s studied so far, looking for clues. People of the Middle Ages were a few inches shorter in stature than people today, i.e. the average male was 5’ 7” (170 cm) and female 5’ 2” (157.5 cm). Did their stunted stature mean there was less to eat? It is possible due to the Little Ice Age; after a long warming stretch, temperatures began to cool rapidly around 1300 and continued to drop until the late 1700s. During those previous long years of warming, plants and farming flourished in more places and so did the people, increasing the population. When temperatures cooled, many places that had once sustained growth were now unable to, and hence masses of people had less and less to eat. While it may seem obvious that the aristocrats were immune because they had money for food, it doesn’t necessarily follow that there was food to be had. Professor DeWitte’s research shows that those who suffered malnutrition earlier in their lives were more susceptible to the Black Death. And while it is true that aristocrats also fell victim, her conclusion is that the poor died in greater numbers, and this mainly due to lack of nutrition earlier in their lives. Most popular from the mid-14th through the early 16th century but used beyond this range, the buckler was a small metal shield fitted with a central metal boss and held by a strap in the fist. Wielded in combination with a sword, its small size of 16 inches (35.5 cm) or less posed little to no defense against arrows or bolts, but provided several other uses for the common soldier and knight. The buckler’s main function was to protect the sword hand in close hand-to-hand fighting. Lightweight and versatile, the buckler proved a quick defense to block and deflect blows via the curved central boss. On the offense, it acted as a “metal fist”; its wielder could punch with it straight on or with the rim. In addition, the buckler could be used to bind the opponent’s weapon or grapple his arm, creating an opening to do further damage. And unlike wooden shields, the opponent’s sword would not get stuck in the metal. While octagon, square, and trapezoid bucklers existed, round seems to have been the most popular shape. Some models featured a central spike, making the punch even more deadly, while others possessed hooks for snaring swords. Other small hooks at the edges are believed to have held lanterns, to light the bearer’s way at night. Sword and buckler training was an established tradition in Europe. For example, English longbowmen carried bucklers and swords into battle just in case the fighting drew near. Yet, bucklers are a topic not generally documented, perhaps because the larger wooden shields carried the heraldry and thus got all the glory. Posted in Armaments, Oath of Iron. From ancient times until the late Middle Ages, a shield was a soldier’s standard equipment. During the years from the 11th to the 15th century, shields evolved side-by-side with armor and other weapons. Many people think medieval shields were made of metal, but the reality is that metal was too scarce, expensive, and heavy for this purpose. Shields were actually made of planks of wood bonded together and reinforced across the back by strips of wood or metal. Over the course of time, the planks of wood were replaced by layers of thin planks of wood, with the grain turned 90 degrees from the preceding layer; the layers when glued together took advantage of the natural strength inherent in the wood grain, much in the same way plywood is made today. Metal staples and fasteners were added to attach the straps and the grip, and perhaps a metal edge to deflect cuts. Often, shield-makers would cover the front of the shield in cloth. From the fall of the Roman Empire until the 11th century, shields in Europe were circular or oblong, with a central grip on the inside and a dome covering on the outside (known as a boss). The longevity of this shape was likely due to its practical application in combat on foot. Mid-11th century, the shape elongated into an inverse teardrop; modern historians refer to this shape as the “kite shield”. The Norman cavalry used this shield to cover the left-side of the body from shoulder to ankle. Being rather unwieldy due to its size and bulkiness, arm straps were added to the hand grip. Added support also came via a body strap that wrapped over the shoulder and under the arm, thus allowing a knight to relax his arm. In the 12th century, the kite shield lost its rounded top in favor of a flat, straight edge. The advantage to the knight was the ability to hold the shield high without compromising his field of vision. 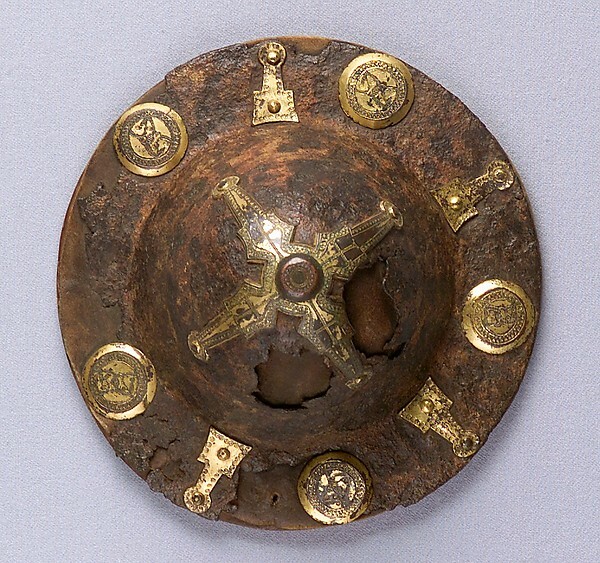 The late 12th to early 13th century produced a smaller version that modern historians call the “heater shield”, since it looks like the bottom of an iron or “heater”. The other significant characteristic is that the shields’ body changed from flat to curved, to better enclose the knight’s side. These smaller shields, about three feet in length, were easier to use in combat and remained in use until the mid-14th century. At that point, the progression of plate armor made shields obsolete, although knights still used them in tournaments. There were two other types of shields used in this later time period through the end of the Middle Ages: the buckler and the pavise. More on those later. © 2019 Oath of Iron, all rights reserved.